Born: 29 September 1743, Doesburg, Gelderland, Netherlands. Died: 25 October 1795, Cape Town, South Africa. 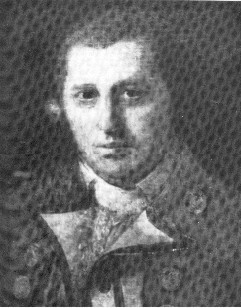 Robert J. Gordon was the youngest son of Jacob Gordon, an officer (later major-general) of the Scots Brigade in the Dutch military establishement. Robert joined that same unit as a cadet at an early age, but from September 1759 also studied at the University of Harderwijk. He showed an aptitude for languages, speaking Dutch, English, Gaelic, French and German. Meanwhile his military career continued - he became an ensign in about 1761 and was promoted to lieutenant some six years later. Early in 1773 Gordon arrived at the Cape on a visit, probably during his leave. In May that year he undertook a six day journey on foot with the plant collector Francis Masson* and botanist Carl P. Thunberg* through the mountains in the vicinity of Cape Town. He also visited the Berg River on the west coast, and possibly travelled eastwards along the coast to Plettenberg Bay or beyond. In May 1774 he left the Cape for Holland, taking back some springbuck for the menagerie of the Prince of Orange (only one survived the journey). He was promoted to captain the same year, and appointed as a captain in the garrison of the Dutch East India Company at the Cape in November 1776. He arrived at the Cape on 1 June 1777. The commander of the Cape garrison at this time was Lt.-Col. H. von Prehn*, who shared some of Gordon's interests in natural history. In October 1777, accompanied by the artist J. Schumacher and for a while by the plant collector W. Paterson*, Gordon undertook a journey in search of a major river that was supposed to exist north of the Sneeuberge. He travelled east to the vicinity of present Willowmore, then north to a point on the Seekoei River not far from the Orange River, not realising how close the latter was. Returning to the Sneeuberge he turned souteast to the Great Fish River near Cookhouse. There he turned north and came upon a large river on 23 December 1777 near present Bethulie. Gordon named it the Orange River, after the Dutch royal house, the House of Orange. No European traveller had visited this area before. Returning via the Great Fish River and Algoa Bay he reached Cape Town in March 1778. In August that year he accompanied Governor J.A. van Plettenberg on a journey to the frontier of the colony. They travelled more or less along the same route as on his previous journey, reaching the point on the Seekoei River where he had turned back. Here, on 3 October, a beacon to mark the northern border of the colony was erected some 50 km south of the Orange River. They returned southwards and then eastwards to present Somerset East and the Great Fish River. On 19 October Gordon left the Governor's party. He travelled to the Sneeuberge but became ill and returned through the Great Karoo to the vicinity of Touwsrivier where he recuperated. He then went north to the Roggeveld and the Hantam, southwest to the mouth of the Olifantsrivier, and on to Cape Town in January 1779. In June that year Gordon set out on his most important journey, accompanied by Schumacher and for various periods by Paterson and other travellers, in search of the mouth and lower reaches of the Orange River. Near present Kamieskroon in July he met Hendrik J. Wikar*, who shared his knowledge of the river and the people living along it. He continued to the mouth of the Buffelsrivier where he joined up with Paterson again, and they proceeded northwards along the coast. Just north of present Port Nolloth they found fossil shells in a raised beach deposit [now regarded as belonging to the Alexandria Formation] - the firs recorded fossil find in southern Africa, described by Paterson. Despite a lack of water they pressed on, reaching the mouth of the Orange River on 17 August. Gordon returned to Kamieskroon and from there travelled northwards to Ramansdrift, while one of his companions, Pieter Pienaar, travelled up the river to the same point. From there they continued upstream to the Augrabies Falls, which Gordon explored. He continued upstream, crossing to the northern bank of the river where Kakamas now is, and proceeded almost to present Prieska early in November. Along this stretch of the river the party saw and shot their first giraffe, which Gordon described in great detail. Returning downstream to the confluence of the Orange and the Houms River he made a detour to present Warmbad in southern Namibia. He returned to the Cape in January 1780, completing a remarkable journey of discovery. On 23 April that year he married Susanne M. Nicolet of Switzerland in Cape Town. Meanwhile Von Prehn had retired in February 1780 and after some time Gordon was promoted to officer commanding the Cape Garrison, with the rank of colonel. His new duties prevented further exploration, though he was able to undertake a last trip from November 1785 to March 1786. First travelling to St Helena Bay, he turned inland at Lamberts Bay and via the Roggeveld and Great Karoo reached the coast some distance east of Algoa Bay. Here, near the mouth of the Boknes River, he recovered some remains of the stone cross erected by Bartolomeu Dias* in 1488. Gordon was undoubtedly the most knowledgeable person with respect to the interior of southern Africa of his time. He made meticulous observations of the geography, fauna, flora, weather and native inhabitants of the regions he visited. For his surveys he used a compass, a quadrant to determine latitudes, and meticulously recorded the direction and hours of travel. Heights above sea level were ascertained with a portable barometer and air temperatures were taken daily. However, he did not publish any of his observations. His travel journals, re-discovered only in 1964 and published in 1988, contain a wealth of information. His maps and hundreds of water colour sketches (many of the latter probably completed with the assistance of J. Schumacher) were assembled in six volumes, under the title Gordon atlas, in the Rijksprentenkabinet, Amsterdam, in 1914. Most comprehensive is his Map No. 3, consisting of four sheets and covering the region from 26 degrees south to 38 degrees south and 4 degrees west to 12 degrees east of Cape Town. It shows, in addition to his routes, every noteworthy geographical feature in the region, the farms, the presence of animals, and the native inhabitants. This meticulously compiled map contains more geographical information about South Africa than any other map up to the end of the eighteenth century. The geographical features Gordon's Bay and Gordon's Peak were later named after him. Gordon's more specific contributions to zoology took the form of some 250 drawings and a number of detailed descriptions of animals. The descriptions were sent to Professor J.N.S. Allemand at Leiden and formed the basis of articles by the latter on South African animals, including the giraffe, hippopotamus, bushbuck, gnu, and the now extinct quagga, in a Dutch edition of the French naturalist Leclerc de Buffon's Histoire naturelle. Gordon also sent skins and skeletons of various game animals (including a giraffe) to Holland for the Prince of Orange's natural history cabinet. Some of the specimens were described by Allamand and A. Vosmaer. The Gordon atlas contains more than 100 illustrations of South African plants, including a number of Stapeliae. Some of his descriptions and sketches of plants were later published in the writings of Paterson, Masson, and others. He grew indigenous plants, especially succulents, in the garden of his home, Schoonderzicht, situated in the present suburb Gardens. The succulent Hoodia gordoni was named in his honour. Two manuscripts by Gordon demonstrate his interest in and knowledge of meteorology. One is a meteorological journal, containing daily observations of the weather and three times daily observations of air temperature and atmospheric pressure taken at Schoonderzicht from 22 September 1789 to 21 June 1792. An English translation of this manuscript was prepared in 1994. The second is an account of meteorology in general, with specific attention to the weather at the Cape. It describes the climate and weather in the vicinity of Cape Town in great detail and is clearly based on Gordon's personal observations over many years, including those recorded in his weather journal. This manuscript too was first published, in the form of an English translation, in 1994. Gordon also made important ethnographical observations, drawing and describing members of the various Khoi and other tribes that he met and noting particulars of their culture, language and lifestyle in his journals. He learned the khoi language and earned their respect. His wide range of interests included stock breeding. He received some merino sheep from the Netherlands and their descendants helped to initiate the South African wool-farming industry. After his death some of his sheep were sold to two Australian sea captains and served to establish a wool-farming industry in that continent. He was a man of outstanding intelligence, showed great hospitality to foreign visitors and freely shared his scientific observations with them. Hence visitors such as Paterson, Masson, Le Vaillant*, Boos*, Scholl* and Sonnerat* held him in high esteem. He was an able administrator too. However, his failure to prevent the British occupation of the Cape in September 1795, though due more to political factors than lack of military competence, dealt his reputation a severe blow and led him to commit suicide. Thus ended the life of the most outstanding resident scientific figure in southern Africa up to the end of the eighteenth century. Barnard, C.J. Robert Jacob Gordon se loopbaan aan die Kaap. Argief-jaarboek vir Suid-Afrikaanse Geskiedenis, 1950, Jaargang 13, Vol. 1, pp. 319-443. Cullinan, P. Robert Jacob Gordon, 1743-1795: The man and his travels at the Cape. Cape Town: Struik, 1992. Dyer, R.A. Colonel Robert Jacob Gordon's contribution to South African botany. South African Biological Society Pamphlet No. 14, 1948, pp. 44-62. Plug, C. Robert Jacob Gordon's meteorological journal, Cape Town, 22 September 1789 to 21 June 1792. Pretoria: Private circulation, 1994. Plug, C. Robert Jacob Gordon's 'Investigations into meteorology'. Quarterly Bulletin of the South African Library, 1994-1995, Vol. 49(1), pp. 11-20; Vol. 49(3), pp. 151-161. Raper, P.E. & Boucher, M. (eds). Robert Jacob Gordon. Cape travels, 1777-1786 (2 vols). Johannesburgh: Brenthurst Press, 1988.